The big game animals, both predator and prey, get all of the attention when people think about safaris in Africa. And between the likes of lions, hyenas, and elephants, it can be pretty dangerous for anyone to be wandering around without appropriate protection. As you'll quickly find out with even basic research into a safari trip is that there are also a number of dangers from the smallest of creatures. And carrying a gun isn't going to help! I've been camping many times and I've had to deal with mosquitoes quite often. For the most part they've been an annoyance which can be somewhat mitigated with insect repellent or even better by wearing long sleeves and pants. Mosquitoes in Africa, unfortunately, also carry malaria making them much worse than just a nuisance. The good news is that insect repellents are more effective because the mosquitoes haven't developed the same sort of immunities as they have in countries such as the US and Canada. Another important counter-measure are malaria pills. They don't offer 100% protection, but even when they don't stave off malaria, they decrease the impact of the illness. I went to a doctor that specializes in the needs of international travelers who asked me if I preferred the once-every-seven days regimen or the daily-regimen. The daily option (Malarone) was more inconvenient, but it was also the form that had the least likelihood of side-effects so I chose it. These flies can transmit sleeping sickness. The chances are slight, but there is a chance. Unfortunately, there's no medication you can take ahead of time. Apparently these flies are attracted to blue so excluding that color from your wardrobe is one step. Insect repellent and keeping exposed skin to a minimum should also help. 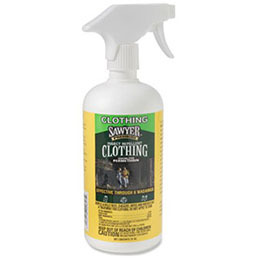 Permethrin is a supplement or possibly an alternative to insect repellent. It's a spray for your clothes, not your skin, and you can apply it ahead of your trip. It's good for 6 weeks and even continues to work after clothes are washed. Permethrin affects the exoskeletons of bugs while not being at all toxic to mammals (except for cats, apparently). Two 24oz bottles were sufficient to cover the safari clothes I packed. Insect repellents and permethrin aren't perfect. Somewhere, somehow a mosquito or fly will get passed those defenses and have at you. To further increase your chances of keeping these critters at bay, you should also consider physical barriers such as netting. For my trip I picked up the very light and super compact Mosquito Head Net from Sea to Summit. I also grabbed a pair of the Mombasa Insect Shield Bug Mitts. I figured these might come in handy while sitting around the camp reading when I don't actually need the full use of my hands. So while I'm in no way looking to discourage anyone from traveling to Africa or going on a safari, I do think it's prudent to be aware of what you're getting into and prepare for it. Besides, you're more likely to enjoy your trip if you're not being bothered by bugs all the time, no?